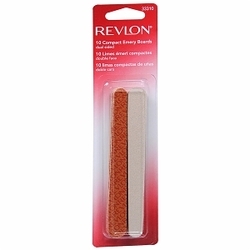 Our reputed entity is engaged in supplying Revlon Dual Sided Compact Emery Boards. - Has a nail protector: to be used in place of your own nails while opening cans and other objects. 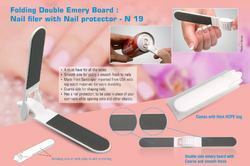 Nails & Toes Emery board 240/240 Nail file is used primarily to shorten or smooth the EDGES of your nails. It's what you use when you don't like the choppy look of a simple nail cutter. It smooths the minuscule ridges in nails and gives them a shiny, healthy look. - Made from Sandpaper imported from USA with top notch materials for extra durability. We are one of the most reliable manufacturer & exporter of exclusive range of Cuticle Pushers. We provide black head remover, white head remover, cuticle cutter, cuticle nipper, pusher, nail filer, scrapper, emery board etc. These products are used for manicure and pedicure treatment. Emery board For filing and defining the shape of the nail. We are amongst the most reputed names in the industry, offering Emery Boards. Our company has been successful in winning appreciation from the clients as one of the most prominent names in the trading of Emery Boards. We are a top-notch organization, engaged in providing Emery Boards. - This buffer is best used to file and shape the nails. Comes in 100/180 grit 100/100 or smooth ones in 240/240 and superfine in 320/320 . Banking on our enriched industry experience, we are able to supply Emery Boards.